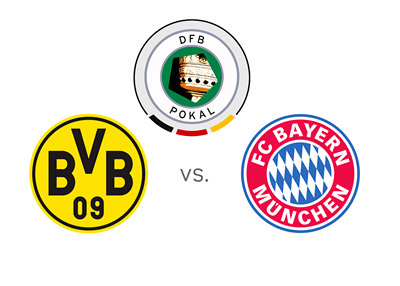 The top two German teams, Bayern Munich and Borussia Dortmund, square off in the German Cup (DFB Pokal) final on Saturday, May 17th at the Olympiastadion in Berlin. Last year's treble winners and this year's Bundesliga champions, Bayern, earned their spot in the final by eliminating BSV Rehden, Hannover 96, FC Augsburg, Hamburg SV and Kaiserslautern. In those five elimination matches, the Munich side scored twenty two goals, while conceding only two. Despite all the trophies and all the wins, things are not so rosy in the Bavarian capital. Bayern Munich have showed weaknesses as of late, including a 5-0 aggregate loss to Real Madrid in the Champions League, as well as several recent domestic league losses, out of which the 0-3 home defeat to Borussia perhaps hurts the most. For the record, Bayern did experiment with lineup and formation in that match. Borussia Dortmund, on their way to the final, got through SV Wilhelmshaven, TSV 1860, FC Saarbrucken, Eintracht Frankfurt and VfL Wolfsburg. They scored ten goals along the way and conceded none. Most recently, Jurgen Klopp's side completed the league season in style, by beating Hertha away, with the score of 0-4. There are several subplots related to this cup final. The biggest one is the transfer of Bundesliga's top scorer, Robert Lewandowski, who will be playing his last match for Dortmund, before becoming a Bayern player. Pep Guardiola, Bayern's coach, find himself in a position where his future at the club could potentially be judged with the Saturday's result. He inherited a forceful and dominant Bayern side one year ago, while at the moment, things are looking shaky at best. Despite their recent slump in form, Bayern Munich are the favourites to defend their cup title. The games between these two German giants, the last year's UEFA Champions League finalists, have, without fail, been some of the most entertaining clashes in Euro football over the last few years. The game on Saturday promises to continue that tradition. Note: Bastian Schweinsteiger is doubtful for the match on Saturday due to a knee problem.